I will design a custom-built itinerary especially made for you according to your desires, your points of interest and your personality and detailed full mini maps will be included so you will enjoy your walk peacefully and quietly. As a local, I know all its secrets and although all streets will lead you to your destination, I will tell you the best ones to take from place to place because some are more charming and pleasant than others. a visit of 10 monuments than a half day itinerary of hot spots. a night itinerary of great romantic views than a full day itinerary of best local shopping places. To resume, I will create an itinerary focused on your preferences and the selected streets to reach the different spots too including recommendations for lunch/dinner/cocktail/club. The starting and the ending points can be your hotel or they can be different. For instance, I can design an itinerary where the starting point is your hotel and the ending point, the most romantic restaurant, totally up to you. For an itinerary of 1 day, the delay is 2 days. In case if some information are missing in your first email, it can be delayed. For an itinerary more than 1 day, contact me by telling the number of days you want and any necessary information. 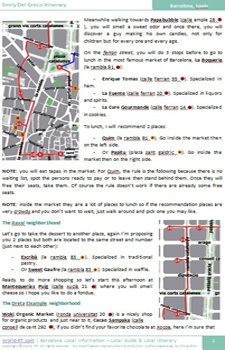 The Barcelona itinerary can also be written in español and in français so just choose your favorite language. You can ask an emergency personalized itinerary, in this case, there is an additional fee which will be included in the price. To read some testimonies, just click here. to send me an email to wrt@world-rt.com with all your details (what you want to see, to do...). Within 24 hours, I will answer you with the delivery day and my rate (minimum price guarantee). Or use the form below to contact me. If all is OK, I will start to design it and once finished, I will send you a confirmation email with a paypal link. You will have to pay with your credit card or with your paypal account (official website). Moreover, I will help you during your stay in the city, meaning that you can drop me an email with your questions and I will answer and help you as fast and much as I can. The other option to walk without a guide, it is to buy my 2 books Barcelona Itineraries, The Urban Hiking and the Secret Hiking, each one contains the best and essential of Barcelona with 22 original itineraries. As a complementary walking tour, you may be also interested about the Itinerary Friend Barcelona. It can be booked with or without the Itinerary Designer Barcelona. This option is if you are looking for a local guide to walk with you with or without your custom built itinerary. Put all details in your first mail to avoid any delay. For any special itineraries (group, family, company, bike, roller, scooter...), please drop me a mail.